The Best Way To Experience Killington, VT Starts With Staying Here! We stumbled upon a real gem. It’s no surprise that we love the mountains, so when a weekend surprisingly opened up, we were ready to take advantage of one. So where do Jersey folks go for a quick two-night getaway to ski? Killington, Vermont, of course! One of our most advanced mountains in the area. We have been to Killington before, but it's typically a 4.5-hour ride up late at night, we sleep and wake up, hit the mountain and drive home the next day. We really never have enough time to fully experience what they have to offer. With some research, we discovered the Highline Lodge. An intimate lodge with only 13 rooms, an active lobby/bar, restaurant, and is only 5 minutes down the road from the mountain. We love the small boutique style hotels, you tend to receive special service and connections to the city you are staying in. It seemed to have everything we needed and the price was right, sign us up! Our plan was to just enjoy the town of Killington Saturday and ski all day Sunday and Monday for when the snow came. Our weekend went mostly as planned but we didn’t plan to make such great connection with some really inspiring people. We quickly got sucked up into the Killington lifestyle. There is an energy here unlike most others. We originally planned on driving up Saturday morning to avoid a late night, blurry-eyed drive. But after speaking with the owner, Kristen, she coerced us to get our butts up there asap because we would be upset if we didn’t. Well, she was right. We sucked it up and got up there late Friday night to a welcoming crowd. Immediately, we felt the “energy” she described and were so happy we made the trek. Cozy fire, great whiskey, and friendly staff made it too hard to leave the bar. As you can see from the photos, who would want to? With a solo acoustic player jamming out to covers and other bar patrons stealing the microphone, we knew we were amongst like-minded folk. Our preconceived impressions about Highline Lodge were confirmed; it’s cozy, welcoming, and exactly the type of experience you won’t get from a larger hotel. Of course, the music was amazing at Highline Lodge but they weren’t shy about sharing other venues to catch great music. It seemed like the thing to do. Hang out at Highline then head to catch a certain band at another bar, only to return back to Highline (aka home base). That was pretty much how the weekend unrolled itself. Hang out at Highline...ski...drinks and acoustic music at Highline...catch another band somewhere….dinner at Highline...watch another band...drinks at Highline….sleep at Highline. It’s that simple. If we weren’t hanging out at Highline, we were hanging out with our new friends made at the lodge and catching music somewhere else. Ultimately, we always ended up back at the Highline with the same crowd. All of us had just met for the first time but it all felt right. Service was unrivaled and another reason we love boutique lodges/hotels. The owner, the staff, and even family were always present to chat or help out in any way. I challenge anyone to find this type of interaction at another hotel. You can’t! First-class service doesn’t have to come from a stranger wearing white gloves, carrying your suitcase, and waiting for a tip outside your door. First-class service is equal parts great food, drinks, accommodations, and conversations all happening in a natural and unmanufactured environment. The cherry on top is that equation and a real connection with its owner, family, staff, and other guests. Screw the Ritz-Carlton...screw other big name hotels….they can’t offer this type of experience. The Highline Lodge delivers impeccable services and naturally fosters unforgettable experiences. The backstory of the lodge even makes it more enticing to visit. Kristen Anderson was a frequent Killington visitor from Connecticut due to her sons' active participation on the Ski team. Killington quickly became her families second home. What we connected too off the bat was that Kristen's former career was in the events industry, (sound familiar?). She balanced a very hectic schedule between family and work (a story we know too well.) If you ask her, her calling was always to be a chef, with her degree from the California Culinary Academy of San Francisco, but as life flies by, your dreams tend to get pushed aside. That is until her daughter, Lauren, stumbled upon the Highline and noticed it was for sale. It was the first ski lodge of Killington, built in 1959, and needed some serious love and care. Lauren’s heart knew that this was her mother's calling and convinced her that it was time to start something new. With a little nudge from her daughter, Kristen pulled the trigger and decided to step into a completely different industry. 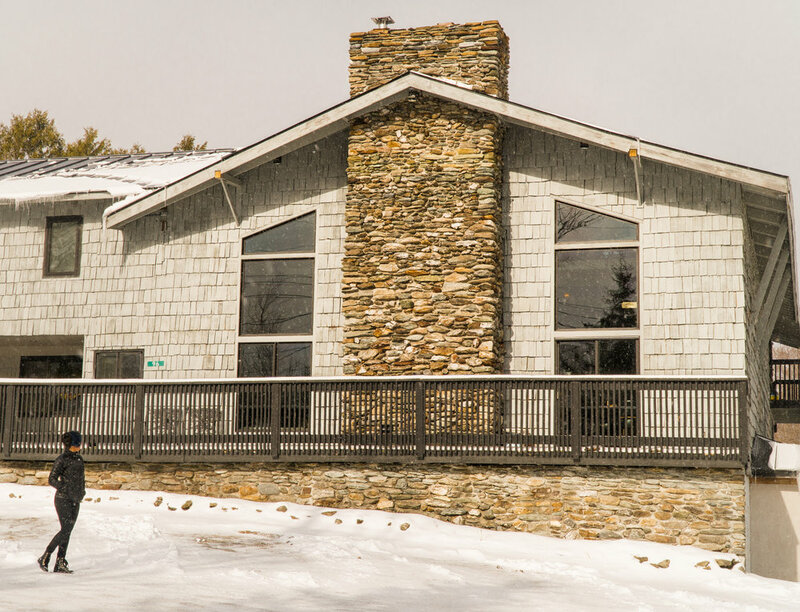 In September 2017, Kristen took the leap to live in Killington full time and rebuilt the lodge to host families like her own that traveled to Killington for the mountain. She wanted to create a home away from home, and that is precisely what you feel the moment you walk in the door. She explains that every bit of decor screams her and her daughters' personality. Check out these amazing BEFORE and AFTER shots! Kristen’s energy is one to be admired. You can find her buzzing through the lodge day in and day out, but also actively participating in all of the fun Killington has to offer. Pop in midday as she’s in the kitchen jamming to always the best tunes and preparing the restaurant for dinner. Come in the evening as she dips into the lobby and personally greets and chats with guests. If her favorite band is playing, you best believe you will catch her sneaking out late night to dance to a diddy, or hits the mountain for few quick runs. You can tell she truly loves what she does and found a way to balance her zest for life and pursuing her dream. Her daughter, who works in NYC in finance, manages to drive up every weekend jumps right into the role of helping out wherever needed, always with a smile on her face. Despite not being able to connect with her husband, Chuck and son Charlie, due to having to attend Charlies final collegiate races, we were made well aware that their support plays a huge role in keeping Kristen's drive alive. The Anderson families see the vision and are on a mission to make it succeed, and whatever they are doing, it’s working. For a lodge that has only been opened for a few months, the town is buzzing about it, and clearly so are we. To sum it up, to see Killington, all you need to do is get there. But to experience Killington, you must stay at the Highline Lodge.